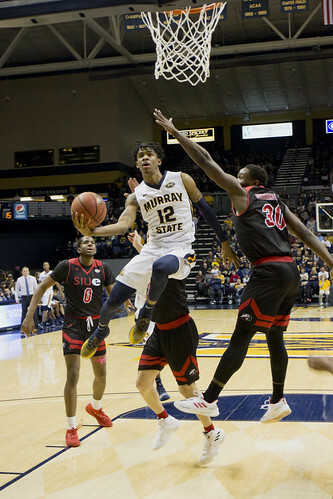 In the waking moments of the 2018-19 basketball season, when many players were shaking off the dust of summer, getting back to the routines of practice and conditioning, Murray State University sophomore guard Ja Morant threw down the gauntlet. At Murray State's Racer Mania, the team’s pre-season exhibition scrimmage in October, Ja lined up four of his teammates in a neat row in front of the basket. He dribbled back to half court, turned, and paused for just a moment, his steely eyes fixed on the goal. Then, he bolted forward. A split second before reaching his teammates, he achieved liftoff, rising in an arc, soaring above the men before him. Upon his descent, he slammed the ball through the hoop with authority, the act punctuated by the crescendo of cheers from those gathered. The moment was not a fluke. Such scenes became commonplace throughout the season. Except Ja wasn’t dunking over teammates—he was dunking over opponents. And fans and the media were waiting, phones and cameras in hand, ready to capture each slam. Quickly, the clips went viral on social media, Ja becoming a sensation across the nation. NBA scouts took notice, and before long, Ja was in the top three prospective draft picks for the NBA. This rising star astonished fans in west Kentucky all season long—and now he’s poised to launch into another orbit, dazzling the world beyond. Some may call it a serendipitous fluke. Some may call it predestined fate. Regardless of the organization or lack thereof of the unseen forces behind Ja Morant’s journey to Murray, the story begins in a way no one would have ever imagined—a man needed a snack. In the summer of 2016, then Murray State assistant James Kane drove to a South Carolina basketball camp to check on one of the school’s recruits, Tevin Brown. As Kane milled about the gym, watching Brown and other players, he felt a bit peckish and inquired where he could get something to eat. Once he reached the concession area, he heard the sounds of a hotly contested basketball match coming from a location other than the main gym. He wound his way around to the auxiliary gym where he laid eyes on Ja who was involved in a 3-on-3 game. Kane recognized his talent immediately. He inquired of camp organizers about Ja who had been a last-minute invite and wasn’t listed in Kane’s book. The next day, Ja was to face Tevin Brown. Kane called Murray State coach Matt McMahon, urging him to come to South Carolina as soon as possible. After McMahon saw him in action, he made an offer to bring Ja to Murray. The encounter with Ja that summer in South Carolina is akin to going for a hike and tripping over the Hope Diamond. And even though James Kane may forget what he ate the day he found Ja in that back gym, it will probably go down as the best snack he ever had. 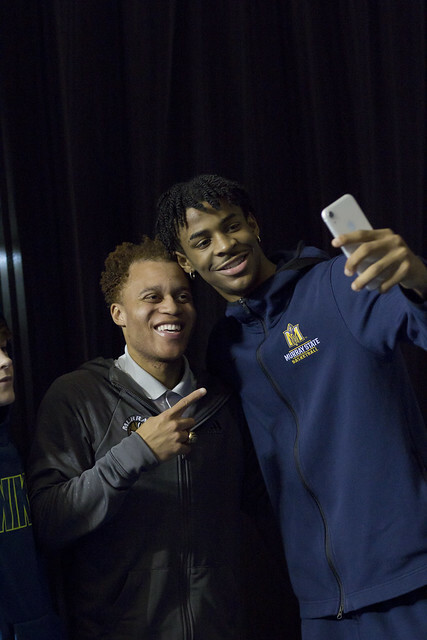 Before the highlight dunks, the numerous records broken, and moments of insane athleticism, Murray State sophomore point guard Ja Morant became the person and player he is in a town of 2,260 people—Dalzell, South Carolina. Dalzell is where Morant grew up, watching basketball and training with his Dad, Tee Morant. Tee knew what it took to get to the next level, having played collegiately and making a run at an NBA career—and he made sure Ja would never miss a beat. While he helped propel Ja to the high level of skill he’s at now, the relationship between Tee and Ja goes far beyond the hardwood. Morant’s support group then goes beyond his father. You can find sections taken up by the Morant family at the CFSB Center, making the 9-hour 11-minute drive to Murray, Kentucky, for the Racers home games. For Ja, Dalzell, South Carolina is more than just home—it's part of him. Morant reps his hometown and state on social media almost daily, as well as all of the fellow talent that came from the area like himself. For him, he’s glad that the place where he grew up is getting the attention it deserves. Much like Morant feels his state was under the radar, Morant was very underrecruited coming out of high school. He had the drive, desire, and talent—he’d been dunking the ball since the age of 14—but he wasn’t getting the looks. The frustrations mounted, spurring him to work even harder. Tee worked tirelessly to train his son and also get his name out to the public. You would often find Tee with a GoPro camera, recording Ja in hopes of getting him noticed. And sure enough, Ja began to get offers, the most of which came after Murray State. As Ja and Tee mulled the options, they were continually compelled toward Murray because of the school’s desire to have him. There was also a feeling of family and appreciation, something Ja knew well back home and wanted in his any program he became a part of. He made his first ripples during his freshman year but still flew under the radar. Flash forward to this season, and you can find the superb athlete’s name just about everywhere. He’s now all over the internet due to high-flying antics and is putting up numbers that are unheard of in college basketball. The sophomore point guard is averaging 23.9 points per game, leading the country in assists at 10.4 per game, while also adding 5.4 rebounds per game and 2 steals per game. Not to mention he’s also shooting 50 percent from the field and 33 percent from three. He has broken multiple records during this season and achieved stat-lines that haven’t been accomplished in the last two decades. Against the University of Evansville, Morant was the first person to put up 25 points, 10 assists, eight rebounds and two blocks in the last 20 seasons. Morant was also the first Division I player in the last 20 seasons to go for 40 points, 10 assists, and five steals in his performance at SIUE. In that game he also made all 21 of his free throws, becoming the first player in the last 20 years to go 21-for-21 or better. He’s garnered praise from many across the sports world but has received his most notable praise from that of ESPN College Basketball Analyst Seth Greenberg, who has referred to him as the most exciting player in basketball. Morant has garnered many comparisons to NBA players like Russell Westbrook and De’Aaron Fox and has even been tagged by Greenberg as “the Patrick Mahomes of college basketball” due to his ability to make passes at different angles. For Morant, watching players like Rajon Rondo and Westbrook are some of the people who have helped mold him into the player he is today. From having practically no attention to being thrust into the spotlight, Morant has dealt with endless amounts of media time and attention on social media. Draft boards have him projected as high as No. 2 overall for the 2019 NBA draft, and articles and videos are posted about him almost daily. Morant sees some of it, but for the most part tries to ignore the hype. 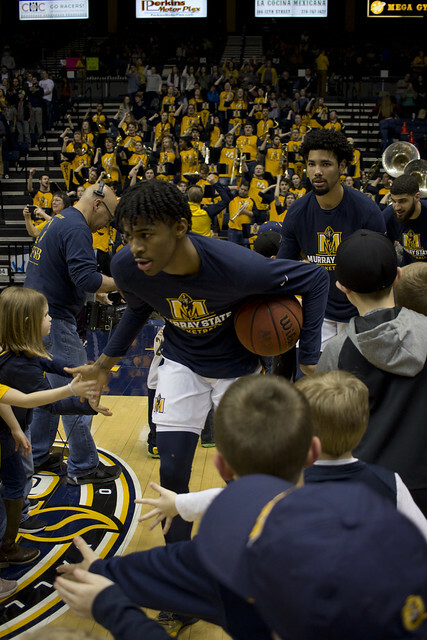 With all the hype surrounding Morant, the Racers team chemistry is a major aspect of what has helped Morant since stepping on campus. You can find the players with each other at almost all times, and despite all the hoopla around the young point guard, Morant is just another one of the guys. It’s clear the guard is destined for the NBA after his time at Murray State, but while some players may have a dream team or specific things they want to do in the pros, Morant just wants to go out and play to the best of his abilities.